Following up from the last article on the global phone units sold over the last three years (Visualizing the winners and losers of three years of smartphone share growth), we take a look at the sales in dollar terms over the same period. 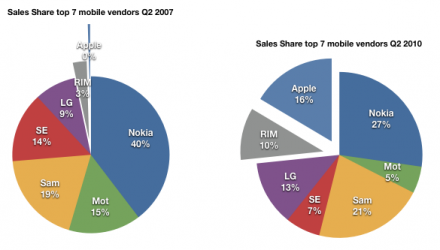 Remember that in the article on units, the pure-play smartphone entrants HTC, RIM and Apple grew from a combined unit share of 1.3% in Q2 2007 to a combined unit share of 7.7% in Q2 2010. That’s a 6 fold increase in volume share. Quite remarkable for companies lacking the vast resources and industry connections of the incumbents. However, when we look at their performance in value (dollar sales) vs. units sold, the performance of the entrants begins to look miraculous. The sales figures can be obtained from the company reports, though I caution that not all vendors publish data and data published is in local currencies. Fluctuations in exchange rates may lead to differences in reports of sales from different sources. For the sake of consistency, I omit all “other” vendors and focus on the top seven: Nokia, Samsung, Motorola, LG, Sony Ericsson, RIM and Apple. I again annotated Nokia and RIM and Apple with actual sales (USD) figures for some perspective. The first thing to note here is that the whole industry sees a low rate of growth (unlike in the units picture). 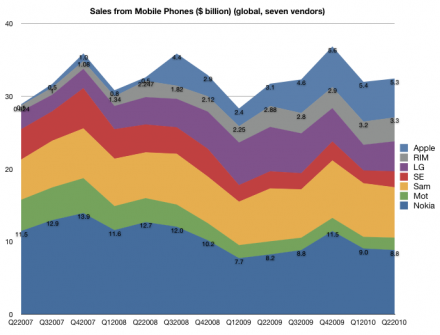 Total sales in Q2 2007 were $29 billion and total sales in Q2 2010 were about $32 billion. A mere 12% growth over three years and only 4% compounded over three years. Total units in Q2 2007 were 255 million and total units in Q2 2010 were 318 million, or 24% over three years and 6.2% compounded. This means industry-wide sales growth is half the units growth. The second thing to note is that the Apple+RIM group grew from 3.3% share of cohort to 26.6%. That means that more than 1 in 4 dollars sent to these 7 companies was spent on Blackberries and iPhones! 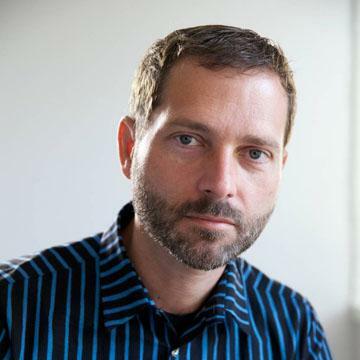 Jointly, Apple and RIM took $8.6 billion and Nokia took $8.8 billion. Compare that with three years ago when Nokia took 40% of the income and RIM + Apple took 3%. So whereas the entrants increased units share by 6x in this time period, at least in this large subset of the market, they increased revenue share by 8x. › Next Post Is an iPhone worth 8 Nokia phones or 2 Blackberries?